We have some work in "Car Culture" which runs through July 8 at the Hera Gallery, 327 Main St., Wakefield. Hours: Wed.-Fri. 1-5 and Sat. 10-4. Phone: (401) 789- 1488. The work gets a favorable mention in the Providence Journal review of June 15. “Another standout is Erik Gould's 20 Roadside Memorials. True to its title, Gould's piece consists of 20 black-and-white photographs of the makeshift memorials that have become such a familiar sight along America's roadways. Fortunately, Gould's understated style preserves the dignity and poignancy of these memorials, which range from simple crosses to elaborate shrines outfitted with everything from candles and flowers to jewelry and clothing. FINALLY, A WORD about the show's juror. He is Bart Parker, a well-known photographer and longtime URI professor who selected the show's 20-odd works from more than 100 submissions from around the country. As is customary with juried exhibits, Parker has written a "statement" that accompanies the exhibit. Visitors will find it hanging just inside the gallery's entrance. Unlike most such statements, this one is at once engaging, intelligent and impassioned. It begins: "Personal leverage, this we love: the telephone, the computer, television, especially the car. We have gone above and beyond to succeed with this mobile shell, our second most expensive possession, our grand export. For cars, we have done great deeds, large and small." 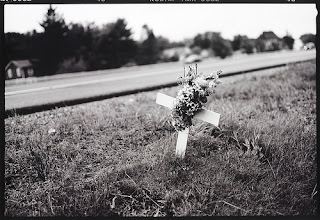 "
"Even more imposing is the block of black-and-white photographs by Erik Gould, 20 Roadside Memorials. The four-by-five grid of horizontal images gives order to the aftermath of chaos: Teddy bears tied to a telephone pole, a victim’s favorite shirt, and many roadside crosses. The violence suggested there is shouted elsewhere." Personal leverage, this we love: the telephone, the computer, television, especially the car. We have gone above and beyond to succeed with this mobile shell, our second most expensive possession, our grand export. For cars, we have done great deeds, large and small. We opened war on Iraq and Hussein while the perpetrator of 9/11 rode away on a donkey. We thought it was fine for the Bush administration to secretly establish an energy policy composed by energy industry representatives chaperoned by an ex-energy executive. We forgave Exxon. The company never paid the Valdez fine. It has earned 5 billion dollars of interest on escrowed funds while the case stalled in court. We are ready to let the "Big Three" auto makers slide on pension and health care contracts, not to mention wages. They will move to China either way. China has become the factory floor for the world. The auto companies wonder. why are we still making cares here when it's cheaper there? As they haggle. BMW. Mercedes-Benz. Toyota and other foreign auto makers build new car factories here and refurbish whole state economies. We demolished the world's largest passenger rail hierarchy, from inter-urban, once connecting the Midwest along the baselines, to coast-to-coast, north-to-south trains of renown. At one time, you could ride from New York to Bangor, Maine, by switching from one trolley system to the next. Los Angeles had the largest municipal rail system in the world, the Big Red Cars. Oil, auto and sales folks got together and tore it up in order to make a market for cars. Watts, inhabited by people who worked up in Beverly Hills and downtown, was left with no transit and no jobs to support the purchase of cars. Burn, burn. Watts never recovered. The Zurich, Switzerland, rail station departs 1000 passenger trains daily. White flight left the city in the new Buick to build the suburbs and exurbs and the strip malls, the most pitiful American architectural manifestation. These are eaten by Wal Mart. Vast regions of America are handcuffed to the car. Shoppers now drive as far as 100 miles to shop the big box, the last store standing, except for the car dealers. Wonder why Wal Mart does not sell cars. Before television there were drive-in movie theaters. Near Yuma are miles of RVs where retired workers live and increasingly, working families with two jobs. And two cars. In the center of the region is an intersection with a gas station on each of the four corners. Sunday mornings older men come to one station or another, fill up the tank, park buy a cup of coffee and watch people come and go at the pumps. They buy a paper and drive home. In the cities some people sleep in their cars. Others live in them. The first draft for this commentary was written while riding in a car. The car replaced the push cart and many things are sold. delivered or catered from them. If trucking came to a standstill, people in the cities would run out of food. The "sexual revolution" rode a Ford into town. There are drive-by funeral homes. A man who knew his heart was buried in his Ferrari. Probably red. We have decided to insure our cars, but not our kids' health. There are huge State Highway Patrol departments and Motor Vehicle Divisions to mother our behavior behind our individual wheels. We maintain our highways, sort of, but are incensed at how much our schools cost. The auto makers do not contribute to highway construction or repair. They do spend billions on advertising. The latest hot selling point is power running boards on Miss Exurb's SUV so that she will not scuff her Blahniks when dismounting at the lawn party after jumping the curb to park on the grass. The only time the vehicle has ever been "off road." We have earned our cars. And the huge repair bills that attend them, for cities as well as cars. The Big Dig is, after all, the bill for a city to put itself back together again following ill-advised highway construction. Millions of drivers, two fingers on the wheel, cell phones irradiating their brains, seat belts off, tailgate past alone into the gridlock. Down goes the gas mileage. But we have decided that $3 a gallon gas is all right. Since China and India now compete for gas, the price of a gallon may not go down, but rise. Pay up. Consider the agenda of organized religion, the lack of constitutional separation between business and government and our car fetish. The United States may not make to the Tercentenary.